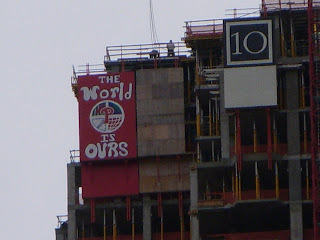 The above photo is at the top of a new condo being built at 18th & Walnut Streets. 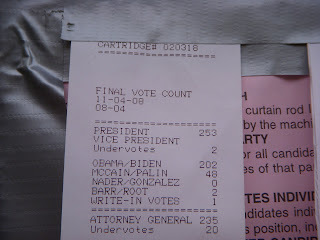 Below is a photo from the polling results from one voting machine as posted at 18th & Spruce Street. The building where I work is used for a voting place. The election results were posted, I guess, as part of the official tally process. When I came to work on Wednesday morning, the sign was up with the printed results for each one of the 6 machines that were used on Tuesday. What a great sign. As we all know, it has been a truly historic week for the United States. I kept saying if the Phillies could win the world series, then anything is possible. While I am only in my 40's, I truly thought that this country would not get its act together to make Obama's historic win happen. Change may be slow to happen, but when it does, more quickly follows. Amen to the end of the Bush era; Amen to the end of the losing drought in Phillies baseball; and AMEN to Barack Obama winning the election.